A Centennial definitives, so called as they were issued in 1967, Canada's Centennial year, have turned out to be the most complex modern-era definitive series. Actually they are only as complex as you make them to be. If you collect by design, format, perforation, and tagging, then they are a relatively simple set to collect. However, if you also include the various gum and fluorescent varieties, then the series becomes complex. 18 basic designs/values were issued. As you add the various printing formats (sheet, precancel, booklet, cello-paq, and coil), perforation changes, tagging styles (not tagged, 3 types of Winnipeg tagging, and 2 types of general tagging), and fluorescence, then the number of collectable varieties grows almost exponentially! 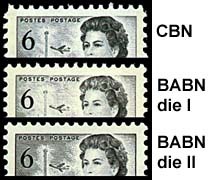 The low values (1c-8c) were printed in panes of 100; the medium/high values (8c-$1) in panes of 50; many of the values appeared in booklets; 7 of the values were also issued in coils. (original) Perf 12 and Perf 10 (coil). Full-toned with distinct clouds. BABN die I Perf 12 1/2x12 and Perf 10 (booklet). Very pale, top & right frames break up. BABN die II Perf 12 1/2x12 and Perf 10 (booklet). Darker with very strong right frameline.